Given that it’s only June and temperatures have already been registering above 100 degrees F, it looks as though we will have a hot summer ahead of us. But, high temperatures needn’t stop us from our bike rides and bike commutes, which is why we want to share with you how we stay cool. Every bit of water you consume will help your body temperature remain low. Increase your intake of watery fruits and vegetables like watermelon and tomatoes. Sodium helps your body hold on to fluids, so drink something with electrolytes while you’re riding. To prevent your drinks from getting warm, freeze one bottle at half full and another at almost-full before topping them off. Aim to drink one 20-ounce bottle every hour. After your ride, drink something with protein, which will hydrate you quickly because protein brings water with it when it travels to muscles. If you choose to drink water, also eat a snack or meal that contains protein and sodium. Remember, caffeine and alcohol are diuretics, which means drinking them will make you urinate more and lose more water. When it’s hot out, stick with water. It may be tempting to toss ice cubes down your clothing, but don’t. When you put ice on your skin, the blood vessels constrict directing hot blood back toward your core, ultimately making you feel hotter. Instead, bring an extra water bottle and a small towel to pour cool water over your neck and forearms, or wipe them with a cool, damp towel. Consider putting a wet bandana around your neck at the start of your ride. Leave yourself plenty of time so you don’t have to rush. Heading out 15 minutes early can make the difference between a sweaty, draining hustle and a pleasant, breezy ride. It’s also worthwhile to budget a few minutes at your destination to splash water on your face and catch your breath. The coolest hours of the day fall between 4am and 7am, while the evening commute tends to be the hottest time of the day. It’s a good idea to have a backup plan, like a filled TAP card to take transit, or a friend you can call if you get partway home and start feeling symptoms of heat stroke (see below). A sunburn can be more than just painful. Fatigue and an increased metabolism are some symptoms of sunburn, and while the latter might sound good, it will be a problem on hot days as a faster metabolism increases your body’s need for liquids. So, do everything you can to prevent sunburn: wear sunscreen, choose clothing with built-in sun protection, and wear a hat under your helmet to shield your face and neck. Lightweight natural fibers are more comfortable, while lightweight polyester prints won’t show sweat. Loose fitting clothing will help you feel the breeze created as you bike. If you need to look professional at the end of your ride, a quick sponge bath and change of clothes will work wonders. And, don’t forget to wear your sunglasses! If you or someone else shows signs of heat stroke, medical attention should be sought out ASAP. While waiting for emergency treatment, get the person in shade or indoors, remove excess clothing, and cool them with whatever means available. You can put them in a cool shower, fan them while spraying them with cool water, or place ice packs on their head, neck, and armpits (source: the Mayo Clinic). Lastly, when it is hotter outside, people tend to drive more aggressively and impatiently. So, be extra careful out there and stay cool! We have great news for everyone who cycles in Downtown Los Angeles– the construction of a protected bike lane on Los Angeles Street (from 1st Street to Alameda Street) has been completed. Woo-hoo! 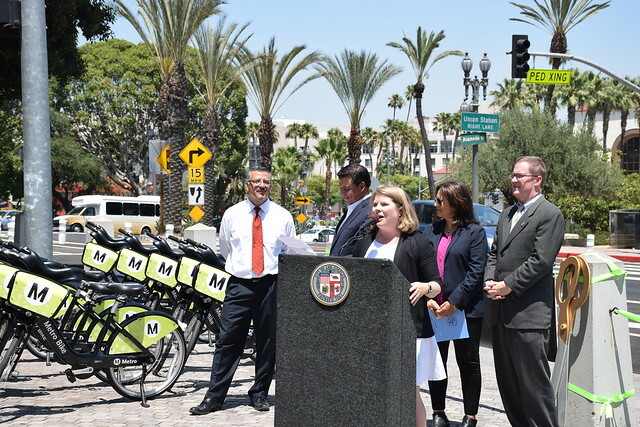 On June 16, a ribbon cutting ceremony for the Los Angeles Street Improvement Project was hosted by CD 14 Councilmember Jose Huizar, LA Public Works Commissioner Kevin James, Deputy Mayor Barbara Romero, and LADOT General Manager Seleta Reynolds. During the ceremony, a group of people rode Metro Bike Share bicycles on the newly enhanced Los Angeles Street. The protected bike lane, featuring the city’s first side boarding islands and bicycle signals, will make bicycling safer and more comfortable from the city’s civic core to Union Station. The following image slider show the “Before and After” scenarios of the project area. Bus platforms that “float” in the middle of roadway are named side boarding islands. Those who bike in urban environments know how frustrating it is to navigate the bike lane while buses weave in and out to reach their bus stops. According to NACTO , side boarding islands eliminate “conflicts between transit vehicles and bikes at stops.” Like the sound of that? Well, these bus platforms will also be implemented on Figueroa Street after the construction of MyFigueroa Project . 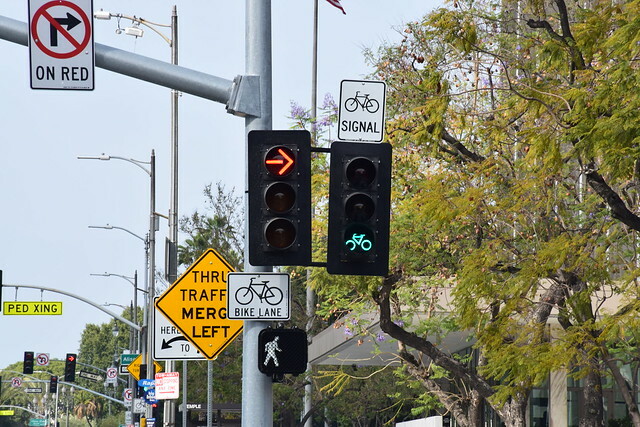 Two bicycle signal heads are now installed, with one at the Temple Street intersection and another at the Aliso Street intersection. These signals dedicate a separate signal phase to bicycles, which will reduce conflicts between right-turning vehicles and bicycles that travel through the intersection. At the intersection of Los Angeles Street & 1st Street, and the intersection of Los Angeles Street & Temple Street, there are Two-Stage Turn Queue Boxes . This street treatment allows people on bikes to make safer left turns. As the name suggests, when trying to make left turns, bicycles should proceed to the bike box area first and then wait for another green signal to bike to the left leg of the intersection. The Los Angeles Street Improvements Project is only one part of the larger scheme to improve the connectivity of Union Station and Civic Center. Metro finalized the Connect US Action Plan in 2015, which provides guidance to implement better pedestrian and bicycle facilities connecting Civic Center, Union Station, and neighborhoods such as Little Tokyo and Chinatown. And, there are a lot of active transportation projects to be implemented this summer. The Metro Regional Bike Share Project has begun to install its stations and will formally launch on July 7. The long-expected MyFigueroa Project, which features similar roadway improvements to Los Angeles Street (bus platforms, bike signal heads, etc), is beginning construction this summer as well. As more and more active transportation enhancements get implemented, DTLA will become a better place for people to enjoy walking and cycling! Last month, City Hall was visited by a team of 10 business students from Rotterdam School of Management in the Netherlands. Hosted by Mayor Garcetti’s Great Streets Initiative, avid bicycle rider and Economics Professor Louis Uljee and his students discussed their latest research on biking in Los Angeles. The class spent their spring semester studying current transportation culture in Los Angeles and opportunities for improvement, and they finished off their research by spending two weeks bicycling all over the City of Angels. They concluded that by creating awareness of the economic and health benefits of riding a bike and increasing safety of bicycle infrastructure, LA can normalize bicycling, generate an inclusive bicycle culture, and increase ridership. You can learn more about their project on their Facebook page, HopOn. From their presentation, we learned a lot of interesting things about bicycling in the Netherlands. Dutch bike culture is so ingrained in every day life because most people begin biking at a very young age. Usually, families and friends in various neighborhoods accompany young children on the ride to school from when they start school at four years old until they turn 10, at which time all children take a “bicycle exam” at school. The exam tests students’ abilities to be safe while riding, including proper hand signaling and bicycle positioning. Passing the test proves to school districts as well as children’s parents that the student can ride to school alone. In the presentation, the business students shared a brief history of how the Netherlands became one of the world’s most bike-friendly nations. Before World War II, bicycling was the most widely-used form of transportation. After the war ended, increased affordability of cars encouraged the Dutch to trade in their bikes for vehicles, and bike lanes disappeared as roads became designed for fast-moving vehicles. Over the course of three decades, injuries and deaths of people on bikes, especially children, caused by accidents with cars spurred a series of protests in the 1970s. Also during this time, increased oil prices simultaneously encouraged people to ride bicycles. With a renewed sense of the health, safety, social, and economic benefits of bicycling, Dutch citizens and government began working to create an expansive transportation network that was accessible and connected by bike. Students from the University of Delft designed the suspended Hovenring to allow for safe bicycle crossing above car traffic. Can you imagine if we had a bicycle roundabout like this above our freeways? Bikeway connectivity would skyrocket! Designer Daan Roosegaarde and Heijmans Infrastructure made the Van Gogh-Roosegaarde Bicycle Path out of thousands of twinkling stones inspired by ‘Starry Night’. A sparkling bike path? Yes, please. Dutch company Heijmans Infrastructure created the BikeScout to increase safety at intersections. Radar trackers positioned along the road for 150 ft. leading to the intersection measure the changing positions of people who bike, walk, and drive. If there’s a collision risk, the LED lights lining the intersection flash, warning cars to stop. A BikeScout in LA would for sure help us reach Vision Zero goals. The POMA Group, a French cableway company, built the CycloCable bicycle lift on a steep hill in Trondheim, Norway. The user places their right foot on a footplate while the left foot remains on the bicycle pedal, and once a button is pressed, the bicyclist is pushed to the top of the hill. I can think of a few hills in Los Angeles that would become a lot easier to bike up with the help of a CycloCable! Red bike lanes keep Dutch bicyclists visible to cars and clearly delineate where bikes should be used. Currently, Los Angeles and many other US cities are working to paint bike lanes bright green to enhance safety for all road users. Even though I left the presentation and discussion with serious bike envy, it was inspiring to hear from the Rotterdam students about bike culture and infrastructure successes in the Netherlands. Here in LA, we have a lot of basic bikeways improvements to be made before we can even think about some of the complex infrastructure that was described to us by the Dutch students. The fact that it has taken about 40 years for the Netherlands to accomplish what they have reminds us that the changes we are making today will undoubtedly have an incredible impact on future generations. Working toward a safe, accessible multimodal transportation network is what keeps us going everyday at LADOT. Secure, safe bicycle parking is an essential element of a comprehensive bicycle network. Demand for bike parking in Los Angeles continues to grow as ridership increases and the City’s bicycle network expands. A lack of adequate parking not only discourages ridership, but also encourages people to lock their bikes to parking meters, trees, or sidewalk furniture. Where there is bicycle traffic and limited sidewalk space, on-street bicycle parking offers a worthwhile alternative…. That’s where bicycle corrals come in! 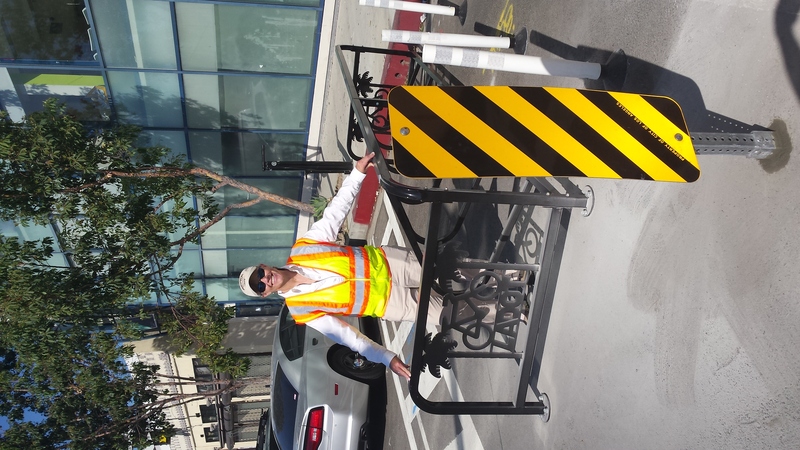 LADOT’s strategic plan, Great Streets for Los Angeles, calls for the installation of over 25 bicycle corrals. We’re excited to announce that this past month, LADOT installed three new corrals: Main Street in Venice, sponsored by The Copper Room, Fuller Street at Runyon Canyon Park, sponsored by Friends of Runyon Canyon, and Huntington Drive, sponsored by Barrio Action. 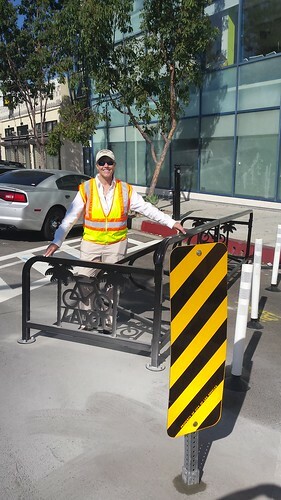 The recent installs account for a total of 14 Cycle Stall corrals, bringing our citywide corral total (including the two pilot corral projects) to a total of 16! This corral can park up to 18 bicycles! The corral on Main Street complements a highly used bike path, making life easier for people on bikes who commute to work or want to explore local shops, restaurants, and the beach. The corral presents a resting point between Santa Monica and the City of Los Angeles, cultivating a bicycle prioritized business corridor. We were happy to see that the very first corral-user parked their bike in a secure way by locking the front wheel to the bike frame, rear wheel, and the corral. Runyon Canyon’s corral serves an important function at LA’s hippest Hollywood park. Runyon Canyon Park does not provide car parking and on-street parking is few and far between. 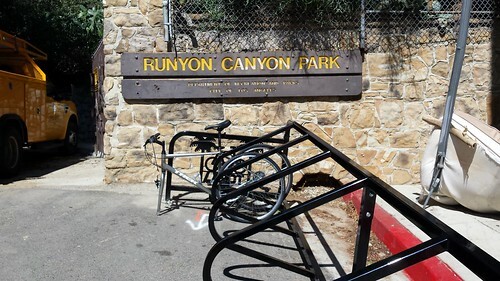 The Runyon Canyon corral increases accessibility to the park, making it easier for people to enjoy the trails, views, and community spaces that the park offers. Today, people can leave their car at home and have a zero emissions workout with a seamless ride to Runyon Canyon. 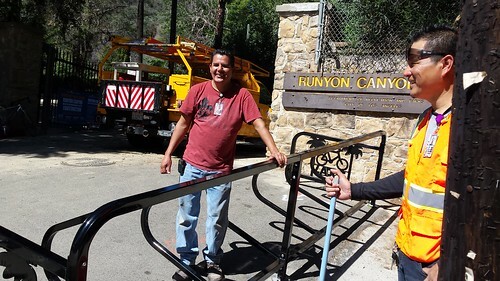 Thanks to our General Services crew, bicycling to Runyon Canyon is now a viable and secure option! The Huntington Drive Corral is located directly in front of our People St and Active Transportation champion, Councilmember José Huizar’s El Sereno Field Office. The corral compliments a bicycle repair station to create a bicycle resource center for the community. 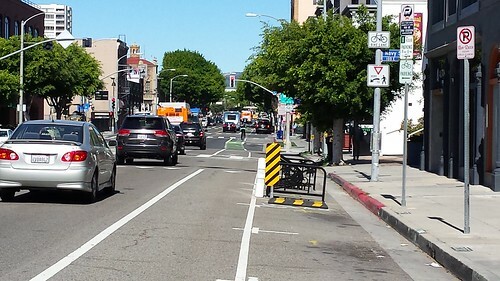 More questions about LA’s Bicycle Corrals? Maybe you are interested in sponsoring a corral yourself? Our People St Corral application cycle is currently on a rolling basis! Learn more on our People St Bicycle Corral page for FAQs and the application. Eligible sponsors include business or property owners, non-profits, and community organizations. Sponsors must sign a maintenance agreement with the City in which the sponsor agrees to keep the corral clean and debris-free. Please note that corral placement restricts street sweeping. We suggest reaching out to our staff at peoplest@lacity.org to advise on any proposed location prior to submitting a full application. We hope you’ll come visit our newest corrals! Find a list of all existing bicycle corrals on our corral page, and you can check out our awesome new City of LA Active Transportation Map to find a corral near you. This past week I took advantage of the nice weather and borrowed LADOT’s Active Transportation GoPro to film a bike ride from my home in South Pasadena to the Silver Lake Reservoir. I am a graduate student at USC and typically commute to school by transit and on bike. Initially, I wanted to use the GoPro to capture my experience on a new route to USC, but instead I decided to go for a relaxing ride without having to worry about getting to class on time. Doing so let me reflect on the perceived differences between biking in South Pasadena and Los Angeles. South Pasadena is very small, so it’s relatively easy to get anywhere on a bike within a few minutes. Los Angeles, on the other hand, is a lot larger and can seem inhospitable for bicycling. However, if you view each neighborhood as its own self-contained community, riding in the City of Angeles can feel like you are traversing a series of small towns rather than a monolithic sprawling landscape. My leisurely-paced journey took me through a few LA neighborhoods and along the way I passed by some of my favorite restaurants and cafes. One of the many benefits of biking is being able to stop and walk right into places that seem interesting since parking a bicycle is a lot easier than parking a car. Just lift your bike onto the sidewalk, lock it up to a nearby bike rack, and go. No circling the block for a parking space! I started my trip at Buster’s Coffee, located on the corner of Mission Street and Meridian Avenue near my apartment in South Pasadena. This neighborhood coffee shop is within walking distance from the South Pasadena Gold Line Station and is a convenient place to meet friends getting off the train. There is plenty of outdoor seating, which is great for people-watching, as well as charming indoor spaces for all your reading/studying needs. For those arriving by bicycle, a hand-painted bike parking sign shows you where you’re welcome to safely lock your bike up towards the rear of the table-strewn alcove next to the shop while you enjoy your meal. After coffee I walked across the street to the great used book shop, Battery Books and Music, to pick up a new read. On a typical day after getting coffee and perusing books I might go to Mix ‘n Munch, which serves great grilled cheese sandwiches right next door to Battery Books. On this relaxed sunny afternoon, however, I went one block south on Meridian Avenue and made a right on El Centro Street, to get to Nicole’s, which offers tasty low-key French fare in a sidewalk cafe setting. The place doubles as a French market so I loaded up my bike’s saddlebags with sandwiches and cheeses, and proceeded to my next destination. After all, you can’t stop at a cheese shop on your way to a meadow and not pack a picnic! After leaving Nicole’s, I pedaled from South Pasadena into the City of Los Angeles by way of the York Boulevard Bridge, which brought me into the Highland Park neighborhood. There are a number of restaurants and shops along York Boulevard easily accessible by bike thanks to the bike lanes. If I did not already have lunch packed away in my panniers, I might have stopped at the Highland Cafe for some chilaquiles. Although I am a few miles from my home at this point in the journey, this translates into a mere 20-something minute bicycle ride, which is enough to get my muscles moving but not so far that it feels like a workout. As I continued west on York Boulevard, I eventually reached Eagle Rock Boulevard where I made a left and continue south. After a short ride down this wide boulevard I find myself in the neighborhood of Glassell Park. I passed by Habitat Coffee, a cafe that recently sprouted up in an otherwise unassuming stretch of Eagle Rock Boulevard. It’s not uncommon to see people enjoying pastries, good conversation, and taking advantage of Habitat’s outdoor dining to enjoy the sunshine. Habitat Coffee’s frontage is accented by our latest sidewalk bike rack design. After winding my way through some side streets I reached Fletcher Drive. As with the other streets I used for my trip, Fletcher is its own main street with blossoming businesses. At this point, it was only a 10 minute bicycle ride to the Silver Lake Meadow where I enjoyed my picnic. To most people, traversing the Los Angeles region by bicycle may seem intimidating. If you watch the video below of my ride, your can judge for yourself how easy it is to get to many local businesses using my bicycle- especially when there are bike lanes available! This trip would undoubtedly be faster by car, there’s no secret there, but when we spend our lives focusing on time saved, we tend to forget about time well spent, and this bike ride was an absolute delight. This blog post was authored by Paul Cipriani, a Student Volunteer Intern in the LADOT Bicycle Program. This year, LADOT’s Sidewalk Bike Parking Program is turning 20! What better way to celebrate two decades of bike parking than by telling you the story of how this indispensable end-of-trip bike amenity in our City came to be. Our beloved end-of-trip facility is leaving behind its teenage years! It all started in 1995, when our Senior Project Coordinator Michelle Mowery spearheaded our Department’s efforts to provide ample amounts of sidewalk bike parking in the City. Initially, the Sidewalk Bike Parking Program was introduced as a “pilot” and was made possible by funds from a Metro Call for Projects grant. During its pilot phase, the Program purchased and installed approximately 1,700 inverted-U bike racks citywide. This momentous investment marked the beginning of the Department’s growing endeavors to encourage and facilitate active transportation in the City. 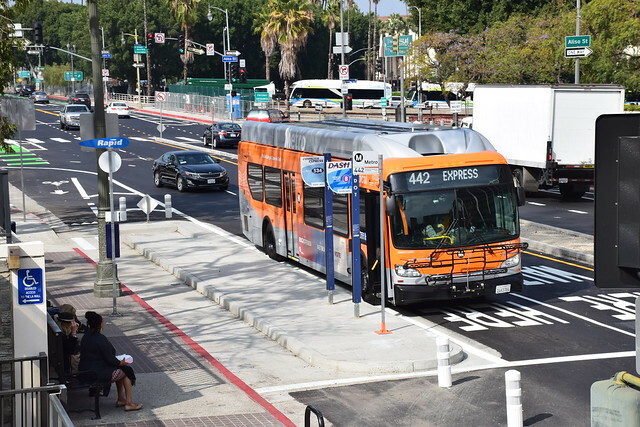 Two years later, in 1997, the L.A. region began experimenting with the first generation of bike racks on buses, as a way to provide greater multi-modal connectivity to people traveling throughout the region. Since its origin, the Sidewalk Bike Parking Program has relied heavily on the work and dedication of graduate students, including Ben Ortiz, Jose Elias, Kathleen King, Austin Sos, Jose Tchopourian, and others, working part-time at the LADOT Bike Program. Over the years, these bike parking mavens have nurtured hundreds of requests for bike parking, from being a data entry stored in a server to being a bike rack on the sidewalk. Our Sidewalk Bike Parking Program installs inverted-U bike racks at the request of business owners or any other member of the public, which definitely includes you. Each rack is 36″ tall, 24″ wide and can hold up to two bikes. The rack is designed to provide great support for bicycles, allowing the person parking the bike to lock both wheels and the bike frame to the inverted-U bike rack without worrying about the bike falling over. The City of Los Angeles assumes responsibility for the rack but not for bikes parked on it. Although there is no fee to request a bike rack and installation is free, all racks are City property. Bike parking installed through the Program can only be placed in the public right-of-way (primarily sidewalks) within the City of Los Angeles. Racks are situated on sidewalks to avoid conflicts with people walking or rolling and people exiting or entering parked motor vehicles or buses. You will find that racks are usually parallel but sometimes perpendicular to the curb and not directly next to building entrances and crosswalks. Our City’s sidewalk bike parking has been turning heads since 1995. Two decades have passed since some of the first sidewalk bike racks were introduced in LA and now we have over 6,000 bike racks on the ground. Much of our public right-of-way has been accessorized with bike parking, allowing Angelenos to ride and park their bikes at locations convenient to shopping, dining, playing, and most other spontaneous activities you can think of. The Sidewalk Bike Parking Program aims to provide highly visible and convenient short-term bike parking near office buildings and retail destinations near public sidewalks. Now that you know where all the sidewalk bike parking in our City comes from, it’s your turn to tell us where people in your community want bike parking. To request a bike rack, complete an online Bicycle Parking Request Form. To determine if a location you would love to have bike parking qualifies for one of our program’s bike racks, please review our bicycle rack location criteria here. You can email bike rack coordinator extraordinaire Jose Tchopourian, if you have additional questions or notice a rack has become loose or damaged. Today, our Department’s Sidewalk Bike Parking Program keeps expanding into new places within the City and upgrading inadequate parking equipment along the way. The Program could not be successful without your requests and feedback. Thank you! Now, walk, ride, or roll to your favorite destination near a sidewalk bike rack to celebrate. The City of Los Angeles is the backdrop to countless scenes broadcast through the lens of a camera around the world. Most commonly, the City is associated with surfing, high school love, Noirs (animated and acted), miles of freeway, and the apocalypse in the form of volcanoes, meteor showers, martians, zombies, and, of course, earthquakes. While movie directors are interested in portraying the destruction of Los Angeles in cinematic productions, civil servants work day in and day out to make sure these catastrophic plot lines don’t unfold and life in the City goes on as usual. This year, a main focus of the City’s is to prepare for the upcoming winter season. Scientists predict one of the strongest El Niño’s recorded will torment Southern California and parts of the Northern Hemisphere from January to March 2016. On November, 2015 the City El Niño Task Force was created by an Executive Directive signed by Mayor Garcetti. The goals of the Task Force are to bring together different City departments to collaborate and ensure the City is prepared to respond and, if necessary, recover from any issues caused by El Niño weather conditions. From stockpiling sandbags (200,00 of them!) to scheduling extra street sweeping, City agencies are ready to handle the wet weather our drought-parched landscape will soon receive. To help Angelenos prepare for changing weather and stay informed about any emergencies, the City has some helpful resources available at its El Niño LA website. Angelenos should check their roofs for leaks, clear gutters of leaves, and make sure their cars’ wipers, tires, and brake pads are up to spec. What if you get around on your bike, you ask? With a little bit of know-how under your belt and the right gear, you can keep riding through El Niño too. Stay one step ahead with our helpful tips below to keep moving through the winter, whether on foot, bike, bus, train, or car. Check the Anatomy of Your Bicycle: The following tips all assume that your bike is working well. Take a few moments to inspect your bike’s most critical parts before your ride. If your bike’s brakes were having trouble slowing you down in dry weather, this is a good time to fix them or take your bike to a shop for a professional’s touch. The rear wheel should lift off the ground when you squeeze your front brake and lean into the front handlebars. Spin your wheels and make sure they aren’t loose. The last thing you want on a wet day is for your wheels to pop off! To ride on streets, California law requires you ride a bike that meets all these specs, rain or shine. Slow Down: Water between the roadway and your bike’s tires reduces traction. Less traction means slowing down and stopping will take more time. The best way to avoid skidding is to lower speed. Take your normal riding speed and ride at 75% that speed or so in the rain. Slowing down gives you enough time to correct any traction issues. Brake Early: In the rain, roadways, tires, brake pads, and rims all get wet and, combined, extending braking time. If your bike has rim brakes, it will take a few tire revolutions before water between the brake pads and wheel is cleared and the brakes can grip the rim. Plan for this delay, look ahead, and start slowing down early to make a complete stop. Brake Straight: Your bike’s brakes work best when you are traveling in a straight line. If you have to slow down or stop, do so before you’re making a turn. Corner Wide and Slow: Make turns at corners slower and wider than usual. Start further out and take the widest and straightest path possible. Avoid sudden sharp turns. Braking while Turning: Don’t do it! Slow down enough (see ‘Brake Early’ tip) before turning so you can coast through the motion. Sudden corner braking may cause your back wheel to skid and slide a bit. If this happens, don’t panic! Just let off the brake and look straight ahead, the bike will straight itself out. Now that you’re riding, braking, and cornering safely, there are some special surface conditions caused by El Niño you should know how to handle. Oil Slicks: After the rain, all the oil and gunk leaking out cars will float to the top of puddles and on the roadway. Keep an eye out for an iridescent sheen when riding and try to avoid riding over it to prevent skidding. If you can’t avoid a slick, coast through it without pedaling or braking to maximize traction. Puddles: What looks like a bit of standing water could be a foot of water filling a hole in the roadway. To help avoid puddle-related hazards, ride towards the center of the lane (take the entire lane when possible) to give yourself enough room to move left or right around puddles. Road Markings and Metal: Road markings can become slicker when wet. Similarly, drainage grates, manhole covers, and other metallic surfaces can become more slippery when wet. Ride slowly enough that you will be able to proceed cautiously over or around these surfaces. Riding tips will help you maneuver through wet conditions and the right equipment and attire will help you stay warm and cozy in any ride. Don’t let the rain stop ya! Get suited up and arrive on your bike. Get Fenders: Invest in some fenders for your bike! These metal contraptions keep all the debris washed onto the roadway by the rain on the ground and off of you. Turn On Lights: By law, you should have a front white light and a red rear light. When it’s raining, even if you’re riding during the day, you should turn on your lights to increase your visibility. Wear Waterproof Garments: A stylish rain cape is a particularly useful do-it-all piece of equipment during inclement weather. It drapes over your whole body, so you can wear whatever you want underneath. Other great options include waterproof jackets or plastic bags in a pinch. Dress in Layers: If you’re not outfitted properly, you’re going to get wet. Make sure you’re wearing clothes that prevent water from getting in while allowing you to vent away excess heat and sweat. It may be cold out but you’re going to work up a sweat riding to your destination, so dress in layers to accommodate your needs. Consider wearing thermal under-layers made of wool or some other moisture-wicking fabric under your clothes during colder, windier days. Gloves are another great addition to prevent your wet and wind-blasted hands from getting too frigid. Save your Stuff: While keeping yourself dry is most important, you should keep your electronics and important documents moisture-free too. Make sure your backpack or panniers are waterproof. If not, cover them with a waterproof layer. You can put the last of your plastic bags to good use here. Protect your Peepers: Wind-whipped water can take a toll on your eyes, so protect them by wearing clear-lensed glasses. Remember, you should be able to see at all times when riding. Rainy days, courtesy of El Niño, are rapidly approaching. Share your new found knowledge and preparation skills with your friends, so we can all keep riding through the rainy season.